Lock in a great price for Motivi Hotel – rated 9.4 by recent guests! Beautifully and individually prepared breakfast trays, which wearied daily, but always were tasty.. Brealfests were served on the a patio amongst flowers, Friendliness and helpfulness of the owners. They gave us a ride to the far-away train station. A very nice family hotel. The owners are very hospitable, friendly and obliging. The room was comfortable and very clean, towels were changed every day. Breakfast was delicious, prepared with care and different every day. The place is a 10-minute walk from Aquahouse Thermal & Beach and the sea. This hotel is very looking good with admirable staff. The breakfast was tasty !!! The view on the garden is nice too. The room was nice and comfortable, the breakfast was delicious (and the portions huge for us, we could never finish everything), the owners were very friendly and hospitable. It's a pleasant, tranquil place. The nearby Bijou restaurant serves excellent Bulgarian food. Altogether we had a lovely time. Breakfast offered different things every day prepared well and with an eye to detail and care for you- i.e offering more coffee or remembering you liked cereals. It is lovely eating outside as well. Very friendly and welcoming owners who made the stay very enjoyable. A very nice place to stay being a family business. The cleanliness of the place is spot on, inside and outside. The breakfast was very good, the hosts serving something new everyday. Beautiful hotel, extremely clean and nicely decorated. The owners are lovely, they went the extra mile to make our stay enjoyable. Breakfast was delicious and very generous. Overall, we had a very enjoyable stay. Highly recommended. Максимально комфортно, насколько это возможно. Приятные гостеприимные интеллигентные хозяева, ухоженный сад, чистота, территория закрывается на ключ (можно спокойно спать с открытым балконом на 1 этаже), терраса, сетки от насекомых, хороший завтрак. Прекрасен малък хотел сред тишина и зеленина. Картините по стените на стаята и коридорите внасят голяма доза домашен уют и усещане за високо ниво на култура. Собствениците са интелигентни и приятно общителни. При всяка възможност ще отсядам там. Motivi Hotel This rating is a reflection of how the property compares to the industry standard when it comes to price, facilities and services available. It's based on a self-evaluation by the property. Use this rating to help choose your stay! Motivi Hotel is located in the Bulgarian seaside resort of St. Constantine, only 1,650 feet from the beach and 5 mi north of the city of Varna. If you want to visit Varna or the nearby resorts you can use the public transport, with the nearest bus stop being only a few feet from Hotel Motivi. The modern building has a bright façade and it is surrounded by a lush garden. 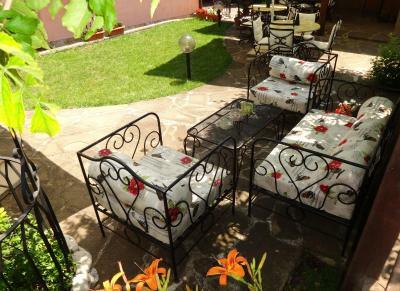 It has comfortably equipped rooms with air conditioning and free internet access. The Motivi provides a fitness room for those who want to stay active and a lobby bar, serving refreshing drinks. 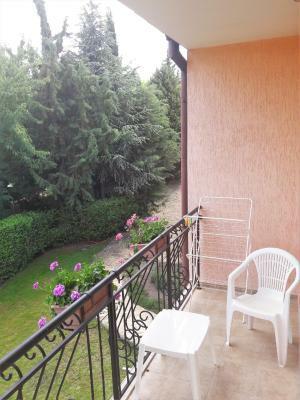 This property is also rated for the best value in Saints Constantine and Helena! Guests are getting more for their money when compared to other properties in this city. When would you like to stay at Motivi Hotel? This room features a balcony, cable TV and a private bathroom. House Rules Motivi Hotel takes special requests – add in the next step! One child under 6 years is charged BGN 4.89 per night when using existing beds. All children under 12 years are charged BGN 14.67 per night for extra beds. 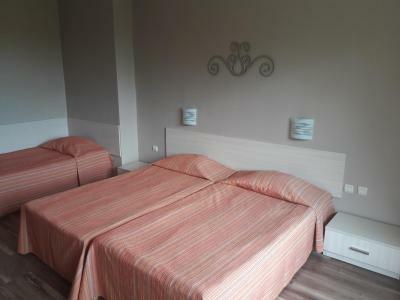 Any additional older children or adults are charged BGN 19.56 per night for extra beds. Motivi Hotel accepts these cards and reserves the right to temporarily hold an amount prior to arrival. Please inform Motivi Hotel of your expected arrival time in advance. You can use the Special Requests box when booking, or contact the property directly using the contact details in your confirmation. No complaints about the place. But the streets around it are quite dark at night. The same thing applies to the entire resort. It's the local authorities problem, actually. Unfortunately , the hotel was very good but surroundings are not at all. Parking on the street in front of the building is a little limited (and when we were there in August, some sticky substance was dripping from the trees onto the cars, which we only noticed the following morning - so have a look before you park). Due to the fact that I don't let the AC on during the night, in the room it was getting too warm. The walk to the nearest beach was not too long, 10-12min but unfortunately nothing has been made by the local authorities to make that walk pleasant, you basically share the street with the passing cars. The lack of proper lighting, paving and trimming goes for the whole of St. Constantine and Elena resort, unfortunately. We personally enjoyed the nearby Kabakum beach much more than the local ones; the bus stop to the beach is right by the hotel and it's a 10-12min ride there. It's a small hotel with spacious rooms, very clean, with comfortable beds and balconies overlooking a nice little green yard. Calm and quiet with very friendly and discrete hosts. One of the best features for us was the breakfast, totally worth the 5 euro/person, served in a delightful little garden, arranged on personal platters for each and every one, varying from day to day with nice little sweet and savoury surprises, good espresso too. We hugely enjoyed the whole experience and even sacrificed some beachtime for the sake of enjoying our breakfast :) The rooms were cleaned and towels changed daily. The air-conditioning worked well and all the facilities and supplies completely matched our expectations for a three-star hotel. The hosts were very accomodating, late check-out could be arranged if needed, they also offer transport to the airport upon arrangement. 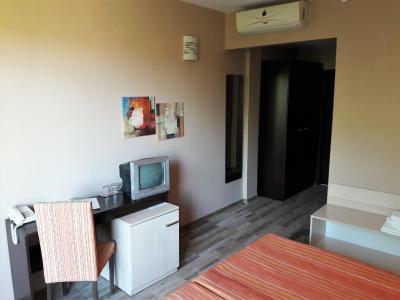 There are convenient bus stops less than 50m away from the hotel with regular connections to Varna ( 12-15min to the city so perfect acommodation for a business trip as well) and to the Sunny Day/Kabakum/Golden Sands beaches in the other direction. 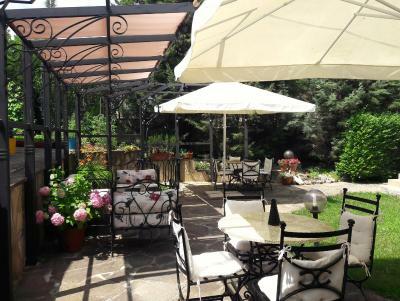 Our family has now decided that Motivi is our place to stay whenever we are back by the northern Black Sea coast again!